We had a beautiful weekend in SF. The sun was out and I spent two wonderful days with family and friends. I never know how I'll be feeling week by week. Sometimes, I feel wonderful and energetic and other times, I get tired quickly and just want to lounge and kick my feet up. This weekend, I had a mix of both so I wore my comfiest get-up. 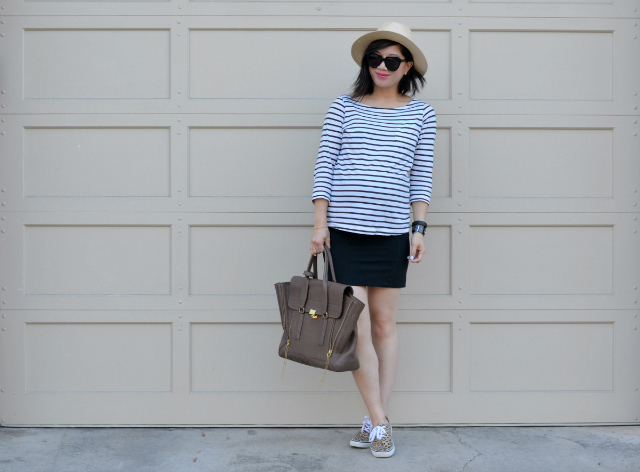 Luckily, good ol' classics like this skirt and stripe shirt combination always makes me feel good. Quite fortuitously, I still fit in both pieces! You look so pretty! Take care and congratulations for your pregnancy! Love this look! It's a perfect example of how you do comfortable but put together and you look great! Yep, sounds like late stage pregnancy all right! Get your yayas out while you can! In the meantime you look so adorable! I can't wait to hear how your pregnancy progresses. When are you due again? Comfort is probably the biggest priority when you're pregnant and this look plenty cute too! Yay for still fitting in your awesome, stylish clothes when you're pregnant. Looking amazing, Nancy! glad to hear you had a lovely time! 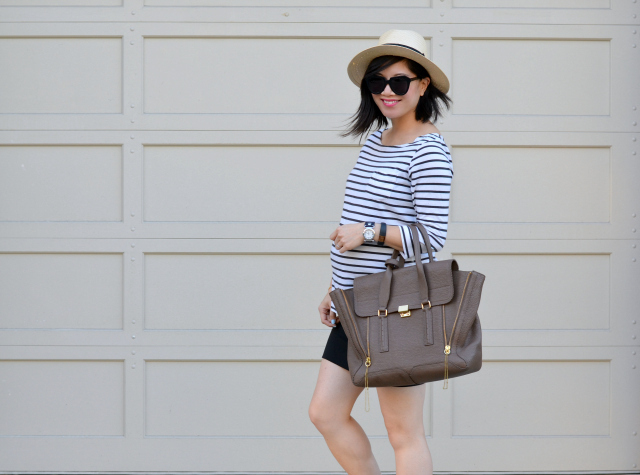 I really like this combo...I always say stripes are timeless! you look so pretty and sweet! so cute, love the stripes! What a pretty, casual chic look! I love the subtle twist with the leopard prints. A perfect weekend outfit! How awesome that you are still not wearing maternity clothes. the hat adds a lovely touch! great outfit! you look great and comfy too! I love this outfit! You look so Parisian and happy. You look Paris Chic in this outfit Nancy! Gorgeous!